Do you ever start a project and find that things just don't go well? I'm not a very patient person, and I typically get an idea, begin the project expecting it to go fast and perfectly, and then get frustrated when things don't work out that way. I can probably count on my two hands the times my projects have gone as originally planned. Can you agree? 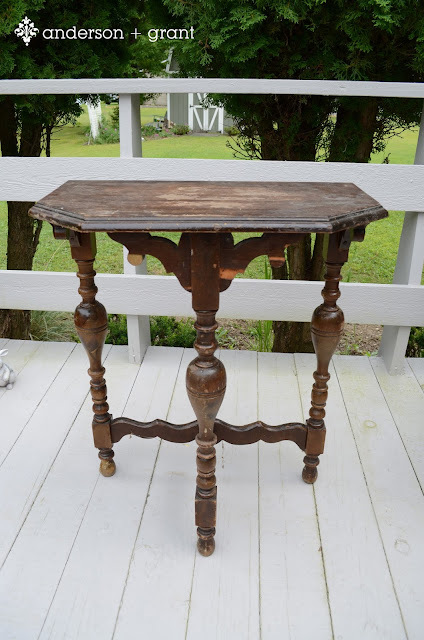 About a month ago, I went to an estate sale and picked up this table, in addition to MANY other things. I knew when I saw the piece that it would be coming home with me before I even asked the price. 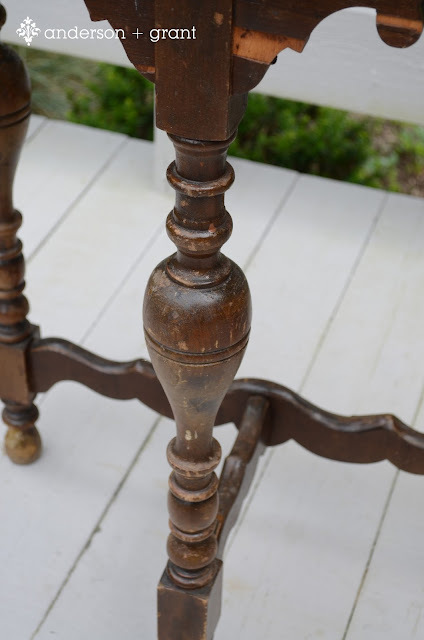 Although it was in rough shape, I fell in love with the turned wooden legs and shape of the table. The problem was, though, that as much as I loved parts of the table, there was a lot more NOT to love. The wooden piece at the bottom connecting the front leg to the back had broken where the joints joined together. Some of the veneer was chipped and pulled away in places. The finish on the top was totally worn in places. Worst of all, there were two small spots in the middle where the veneer was raised, but not enough to get glue under to push it back down. I decided that this could be a piece I could experiment with, and boy, did I ever! I went through a lot of sandpaper, had "stain-dust" all over the place, and suffered quite a bit of frustration. I put a lot of time and elbow grease into getting this table to look like I wanted it to, and not that it's done, I couldn't be happier. I'll share pictures of the finished piece and photos of my process later this week. Today's post is about being okay with experimenting and having things NOT turn out the way you want them to. Things you try will not always work. Sometimes you have to do something over again, and in my case, over a third time. Sometimes you have to think outside the box in order to fix a problem. There will be times when you try something that seems strange, but it works so well that you want to share it with others. That is all part of the DIY process, and quite frankly, part of life. What you can't do is give up when something doesn't work. Take some time away, regroup, and try again. Eventually things will work out and you'll be so glad when they do. That's my inspirational message of today....keep trying. 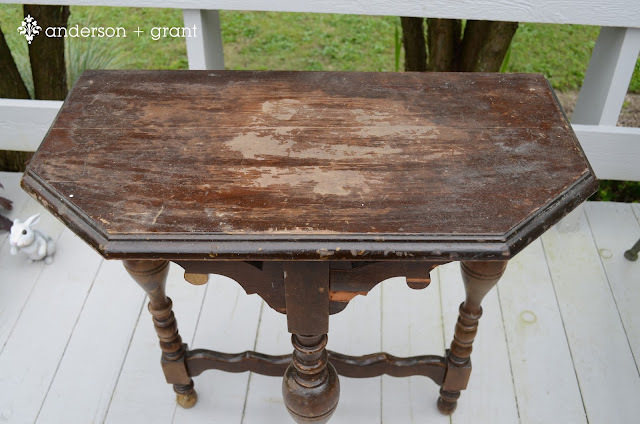 Be sure to check back later in the week to see my table transformed into a piece of beauty!